What country lies exactly on the other side of your location? Is there even land at all, or is it just ocean? 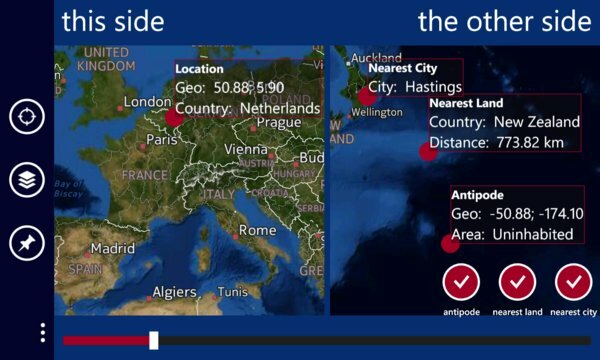 This App will help you answer these questions, and let you explore the antipode and its surroundings of any location in the world. * Find out what is on the exact opposite of your location and what country and city are the closest to it. * View the antipodes of any other location in the world. * Choose from different styles of maps. * Zoom and pan to whichever detail you would like to observe. Manipulating one view also impacts the other, so you always have a view of what's on the other side. * Pin chosen any location to your start screen. The tile will flip regularly and show the other side! - Opening a pinned location directly navigates to the right geo position. - Improved interface (larger view port, prettier colors, and more). - API to launch from other apps. - Option to view nearest land mass to antipode. 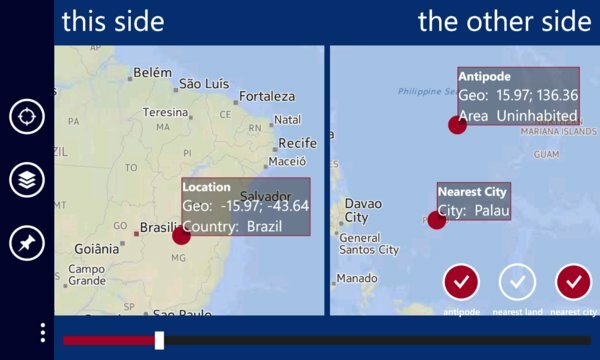 - Option to view nearest city to antipode. - Buttons to toggle antipode, nearest land mass and nearest city.